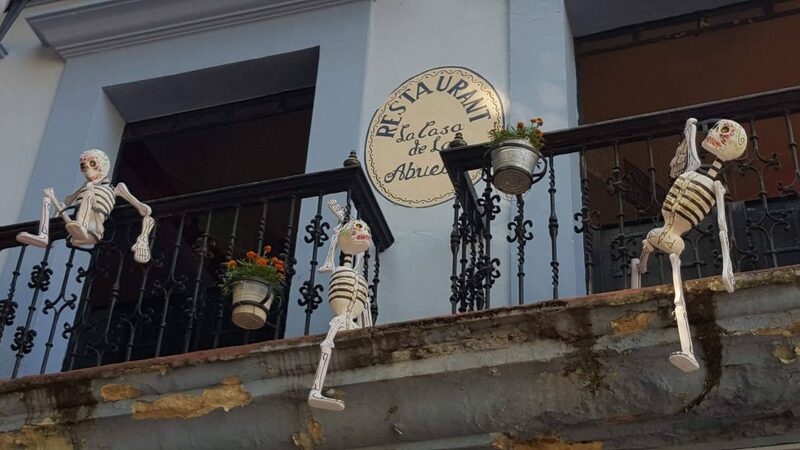 How to Enjoy Oaxaca Day of the Dead - Come adventure with me. In part three of our walking vacation in Oaxaca, we returned to this vibrant Mexican city all decked out in its marigold-finest to celebrate Day of the Dead (Dia de Los Muertos.) 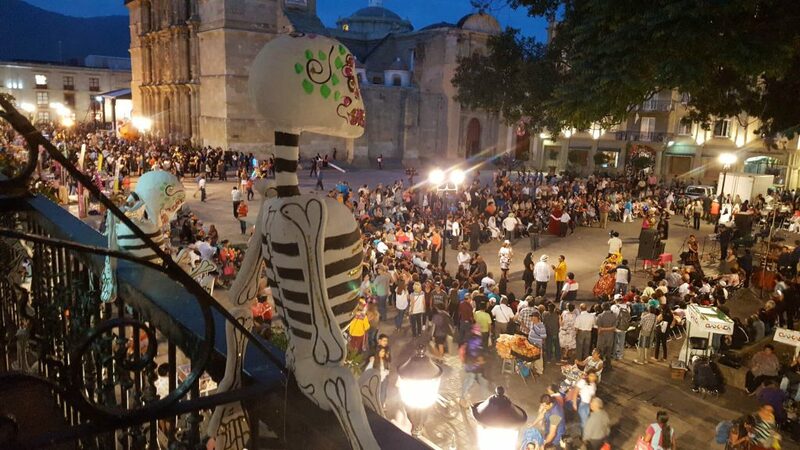 Oaxaca, the cradle of excellent Dia de Los Muertos celebrations, spreads the party over four days, dedicating each day to someone different. Our visit put us in the middle of these family affairs, finishing the night in the historic cemetery, Xoxocotlan. Read about our first days in Oaxaca and our urban hike. 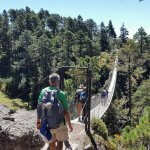 Read about the middle of our trip where we hiked the Pueblos Mancomunados in the Sierra Norte Mountains. After hiking in the mountains for a week, we returned to Oaxaca. Where we had left a calm city on the verge of a giant celebration, we returned to a center of fun, vibrancy, and remembrance. 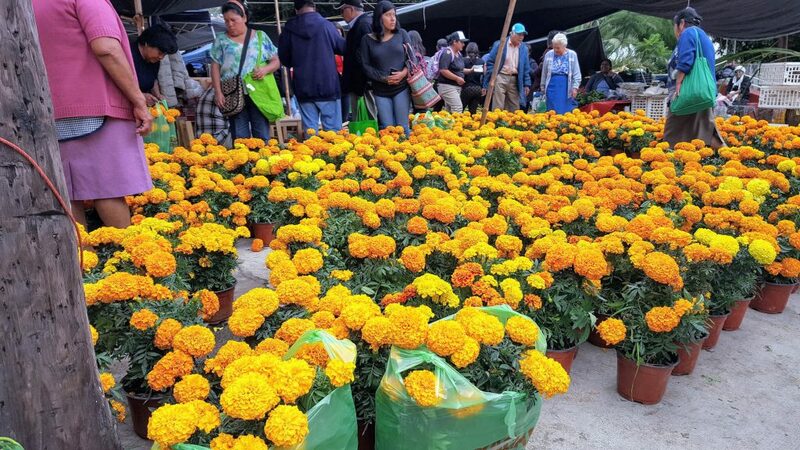 Marigolds flooded the local markets, incense burned from vendors, and pan de los muertos tumbled from every bakery. 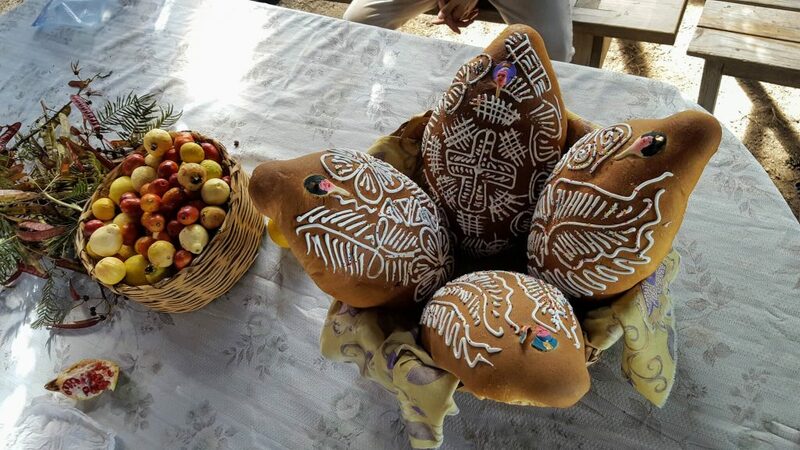 Oaxaca’s Day of the Dead celebration preparations were in full swing. The zócalo buzzed with new activities. A large tent with screen dominated the open space, and kids poured in to watch Coco, Disney’s movie about Dia de los Muertos which is set in Oaxaca and based on real characters (see my first post about alebrijes. Our guide’s friend is the model for Grandma Coco!) Artesans from surrounding villages had arrived to sell their one-of-a-kind wares, and people were parading around in bright skirts and fanciful faces. The first day of Dia de Los Muertos exists for the children. It’s hard to not take pictures. The kids dress up in their favorite skeleton customs, painting their faces with bones, and putting giant flowers in their hair. Parents herd them along in parades while giant tuba-based ensembles blare out dancing tunes with Mexican rhythms. Vendors beckon on the sidelines with makeup brushes for impromptu costumes while churros and tuna ice cream spill from little hands enjoying holiday treats. Celebrating Day of the Dead is an interactive sport. We joined the parade, danced with the tuba players, and clapped as dancers spun in the square to live music. But Day of the Dead is not like Carnival or Mardi Gras. There’s a family atmosphere punctuated by children everywhere and a belief that dead family members are enjoying the festivities too. It’s common to ask, “Quien espera?” or “Quien desea?”–who are you waiting or hoping for? After enjoying a delicious dinner of fish in banana leaves at La Casa de la Abuela, which has great seating overlooking the festivities, we headed to the historic town of Xoxocotlan. The oldest cemetery comes alive with ofrendas on graves honoring the returning dead. 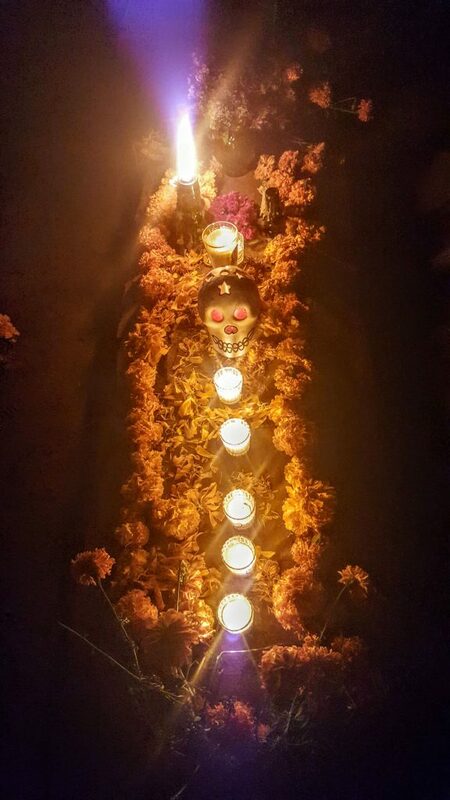 Families decorate tombs, bring candles, and toast family members with mezcal. Thousands of people crowd the town, there to see the sugar and sand memorials on display, to find their friends, and to honor their dead. Informal bands roam through the streets and into the cemeteries playing tuba-infused tunes, and formal bands set up on stages to play traditional celebration music. It’s a night of loud but not raucous fun filled with respect and honor, tinged by shots of mezcal. For us, we struggled with our traditional values of being quiet in cemeteries. This was a night to let those thoughts go and just go with the flow. Our night ended around 2 am back at the hotel in Oaxaca. Fireworks still flared the sky. Yet the night slowly feel asleep, only to wake up the next three mornings ready to repeat the festivities. Day two of Day of the Dead is for anyone who has died, Day three is for the living, and Day four is for families. Or, that’s my rough interpretation of the celebrations, and I could be completely wrong. This could also vary by city; Oaxaca tends toward this structure. If you go to Oaxaca for Day of the Dead, relax, go with the flow, and be respectful. This isn’t a bacchanal event. It’s family with mezcal. It’s flowers, incense, and thoughts. It’s a happy time. But with respect and honor. Enjoy it!